On 12 September 2018, the ABA Journal published an article about, and a podcast featuring, Ken; both are available here. In episode 54 of the Civil Engineering Podcast, released on 29 March 2017, Ken was interviewed about how to make engineering contracts clearer. On 9 January 2014, the Legal Writing Institute announced that Ken is to receive the Golden Pen Award for 2014. The Golden Pen Award honors those who make significant contributions to advance the cause of better legal writing. For more information, go here. On 8 October 2013, the WSJ Law Blog published this item about Ken’s article critiquing an opinion of the Second Circuit Court of Appeals. In December 2012, the ABA Journal named The Koncise Drafter one of the 2012 Blawg 100—the hundred best legal blogs as selected by the Journal’s editors. 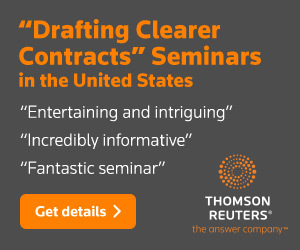 The following commentators have written about Koncision Contract Automation’s confidentiality-agreement template [no longer available online]: Venkat Balasubramani, Sean Doherty, Carolyn Elefant, Ron Friedmann, Jordan Furlong, Geoff Gussis, and Brian Rogers. An article on practice support lawyers in the July 2011 issue of the ABA Journal cites Ken’s views and mentions his blog post on the subject; click here to go to a copy of the article. In December 2010, the ABA Journal again named the AdamsDrafting Blog one of the Blawg 100—the best legal blogs as selected by the Journal’s editors. 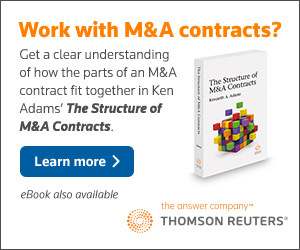 An April 9, 2010 article on contract language in The Lawyers Weekly, the Canadian periodical, quotes Ken; click here to go to it. This item posted on February 23, 2010, on the Construction Law Monitor blog discusses Ken’s blog. In December 2009, the ABA Journal named the AdamsDrafting Blog one of the 2009 Blawg 100—the best legal blogs as selected by the Journal’s editors. An article in the October 29, 2009, issue of The Wall Street Journal quotes Ken on the subject of the phrase “throughout the universe”; click here to go to it. As part of its “Legal Rebels” project, in September 2009 the ABA Journal named Ken Adams one of fifty “legal innovators.” Click here to go to the ABA Journal’s profile. The July 17, 2009, issue of The Lawyers Weekly, the Canadian periodical, contains an article about Ken’s efforts to turn contract drafting into a commodity task. Click here to go to a pdf copy. An article in the March 24, 2009, issue of The Financial Times profiles Ken and his approach to contract language. Click here to go to it (free registration required); click here to go to a pdf copy. In this post on his blog announcing his 2007 “Blawggies,” the technology writer Dennis Kennedy named Ken’s blog the best practice-specific legal blog. The December 14, 2007, issue of The Lawyers Weekly, the Canadian legal periodical, contains an interview with Ken. Click here to go to a pdf copy; the first page contains a photo and the interview is on the second page. An article in the October 25, 2006, issue of The New York Times mentions that Ken was retained by Rogers Communications as an expert witness in the dispute over the “million-dollar comma”; click here to go to it. An article in the August 15, 2005, issue of The Legal Intelligencer discusses Ken’s contract-drafting course at the University of Pennsylvania Law School. Click here to go to a pdf copy. An article in the August 31, 2001, issue of The New York Law Journal profiles Ken and discusses his first book, Legal Usage in Drafting Corporate Agreements. Click here to go to a pdf copy.